HOUSTON  (Jan. 19, 2010)  The Houston real estate market closed out 2009 with a more realistic snapshot of local conditions, ending three months of sales readings that appeared high when compared to the fall of 2008 due to Hurricane Ikes crippling effects on housing back then. According to the latest monthly data compiled by the Houston Association of REALTORS® (HAR), December volume of single-family home sales across the greater Houston area dipped 2.1 percent compared to December 2008. That represents the first decline since last August. 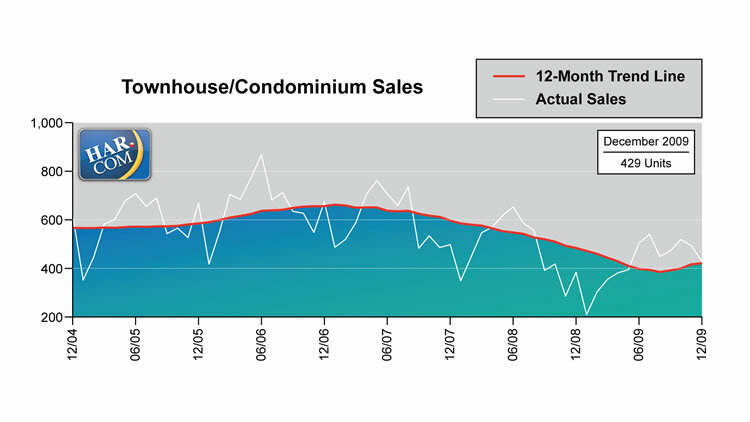 Total December property sales were flat on a year-over-year basis. At $152,550, the December single-family home median pricethe figure at which half of the homes sold for more and half sold for lessrose 5.2 percent from one year earlier, representing the eighth consecutive monthly increase in median price. The average price of a single-family home in Houston appreciated for a third straight month, reaching $219,214, up 15.1 percent versus December 2008. That figure represents the second highest for all of 2009 and the highest for a December in Houston. Foreclosure property sales made up 21.0 percent of all single-family home sales in the Houston area in December compared to 25.5 percent a year earlier and the 2009 peak of 34.0 percent last January. The median price of December foreclosure sales reported in the Multiple Listing Service (MLS) rose 4.2 percent to $89,900 on a year-over-year basis. Sales of all property types in Houston for December totaled 5,267, flat compared to December 2008. Total dollar volume for properties sold during the month was $1.1 billion versus $976 million one year earlier, representing an increase of 12.9 percent. The Houston housing market concluded calendar year 2009 on sturdier ground than 2008, with only a slight decline in property sales and pricing that was generally flat. There was an 8.2 percent decline in volume of total property sales and total dollar volume tumbled 10.7 percent. The median single-family home price edged up 0.7 percent in 2009 to $153,000; the average sales price for a single family home was $203,626, down 2.2 percent on a year-over-year basis. The month of December brought Houstons overall housing market mixed results when all listing categories are compared to December of 2008. Total property sales were flat while total dollar volume and both median and average single-family home sales prices climbed on a year-over-year basis. The number of available properties, or active listings, at the end of December declined 1.3 percent from December 2008 to 43,185. That represents 2,267 fewer active listings than one month earlier, in November 2009, and reflects what the industry considers a healthy absorption of housing inventory from the marketplace. Decembers month-end pending salesthose listings expected to close within the next 30 daystotaled 2,700, which was 17.9 percent lower than last year and may signal another decline in sales volume in January. The months inventory of single-family homes for December came in at 5.8 months, up from 5.6 months one year earlier, but remains better than the national months inventory of single-family homes of 6.5 months, reported by the National Association of REALTORS® (NAR). At $152,550, the median sales price for single-family homes rose for the eighth consecutive month, up 5.2 percent from December 2008. The national single-family median price reported by NAR is $171,900, illustrating the continued higher value and lower cost of living that consumers enjoy in the Houston market. The average price of single-family homes in December was $219,214, an increase of 15.1 percent from one year earlier. That represents the third straight monthly jump in the average price, which reached the second highest level for all of 2009 and the highest for a December in Houston. December sales of single-family homes in Houston totaled 4,456, down 2.1 percent from December 2008. This is the first decline in sales volume since last August. 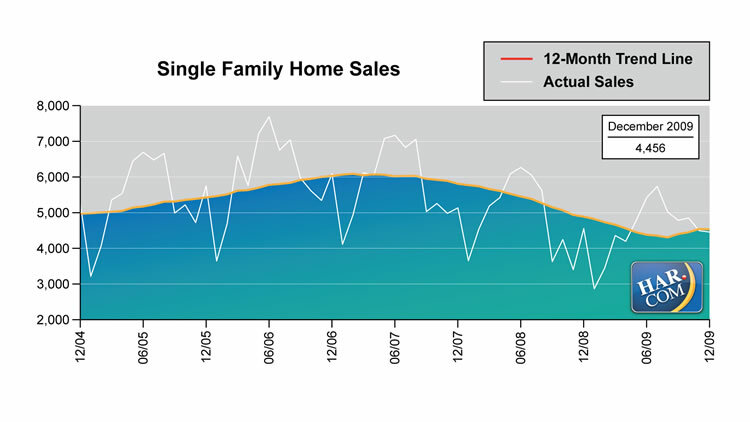 HAR also reports existing home sales statistics for the single-family segment of the real estate market. In December 2009, existing single-family home sales totaled 3,611, a 3.0 percent increase from December 2008. At $138,950, the median sales price for existing homes in the Houston area rose 7.7 percent compared to last year. The average sales price of $202,019 shot up 19.7 percent from its December 2008 level. The number of townhouses and condominiums that sold in December rose 11.7 percent compared to one year earlier. In the greater Houston area, 429 units were sold last month versus 384 properties in December 2008. The median price of a townhouse/condominium dipped 1.6 percent year-over-year to $123,000. 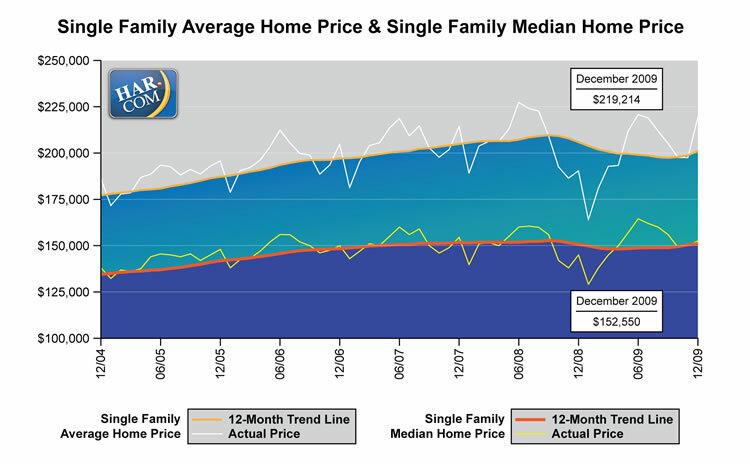 The average price retreated 6.2 percent to $156,026 from December 2008 to December 2009. Demand for single-family home rentals rose 3.1 percent in December compared to a year earlier. Year-over-year townhouse/condominium rentals climbed 4.7 percent. Total dollar volume grew 12.9 percent, reaching $1.1 billion. The computerized Multiple Listing Service of the Houston Association of Realtors® includes residential properties and new homes listed by 24,000 Realtors® throughout Harris, Fort Bend and Montgomery counties, as well as parts of Brazoria, Galveston, Waller and Wharton counties. Residential home sales statistics as well as listing information for more than 50,000 properties may be found on the Internet at https://www.har.com. Founded in 1918, the Houston Association of Realtors® (HAR) is a 24,000-member organization of real estate professionals engaged in every aspect of the industry, including residential and commercial sales and leasing, appraisal, property management and counseling. It is the largest local association/board of Realtors® in the United States as well as the largest individual membership trade association in Houston.